YEP. 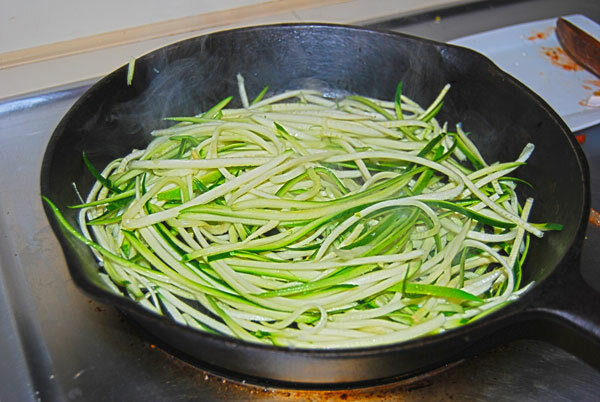 There is indeed a way to do low carb spaghetti using zucchini instead of noodles! I found a nifty Julienne tool at Bed Bath and Beyond. It was on sale for $12.00 US. There was a nice stainless potato peeler AND the Julienne tool in the package. Both are very sharp and seem to be doing well in the dishwasher. The texture/size/consistency of the Julienned zukes are what I would call a near perfect simulation of noodles. I think I have mentioned before that I just don’t care for the other “veggie noodle” alternative (spaghetti squash) due to its sweetness and mushy consistency. I made a very large batch of the meat sauce since it’s a perfect candidate for freezing. I have to admit the kiddo misses real noodles, so on the leftovers I cook some pasta up, arrange in lunch containers with broccoli spears and freeze. Since they have microwaves at her school she’s able to have a fairly healthy lunch with very little effort prepping in the morning. Brown the meat in a very large saucepan, this makes alot! Drain grease and remove to plate. Sautee onions – no oil neccesary for me since my pan is nonstick. Remove to plate. Sautee mushrooms in a wee bit of oil (2 tsp.). Add canned tomatoes and tomato paste to mushrooms. Add the olives. 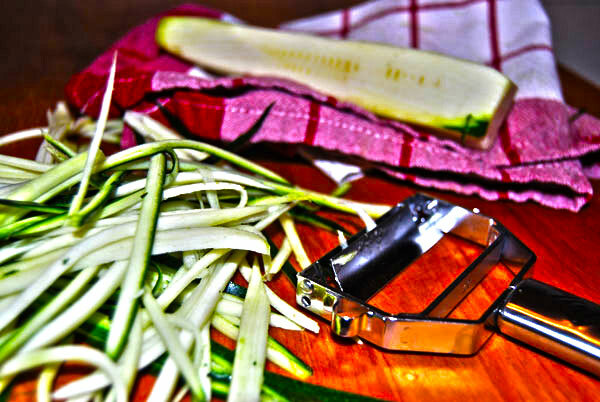 I don’t buy pre-sliced since they are more expensive….I use whole medium pitted, and simply “squash” them between my fingers to break them up a bit. Add all seasonings and stir until the tomato paste incorporates into the sauce, then add the beef and onions back to the pan. Simmer for 30 min (or more if you have the time). Serve topped with grated parmesan. Sauce recipe makes 3 quarts. Thanks drunk ninja ! Another excellent substitute for pasta is Shirataki noodles, although they are a little expensive. At my grocery store they have fettuccine style and regular spaghetti style. I find that they go great with “saucy” dishes. I have recently made beef stroganoff and chicken cacciatore with them (just haven’t had the time to post the pictures yet. Good luck with the low carb ! Here are a couple of posts related to Shirataki…. this is awesome, i brought a few bags of shirataki (the clear ones, not the tofu ones yet) noodles yesterday so I will definitely check out your recipes. shirataki noodles’ been around for awhile so it may be cheaper in asian supermarkets than low carb specialty stores (although many are packaged in bundles because most use it for “hot pot” if it’s not for low carb reasons). The packs I bought yesterday was just loose strands in bags (i bought angelhair and spinach – looking forward to try the spinach one) and I want to do something different than putting it in hot pot. That looks really good! Going to have to make this! 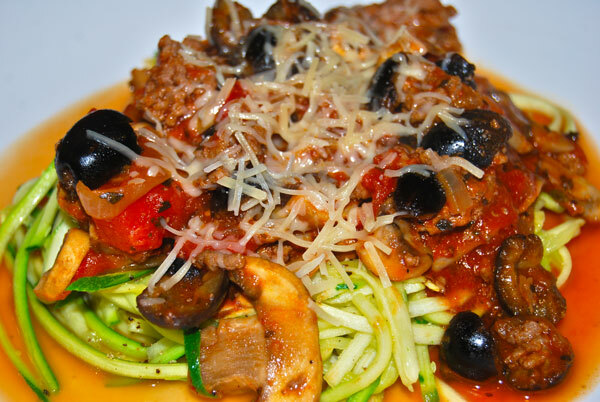 I usually make meat sauce with spaghetti squash but LOVE zucchini so am so excited to try this variation!! Fabulous idea! Yum! This one goes on the “gotta try” list.